Schedule an appointment with your manager, partners, agents, suppliers and clients in the spaces of one of the most modern stadiums in Europe allows you, starting with the invitation, to highlight the foresight, the orientation towards the future and the big goals of your company. Moments of leisure and classy hospitality are just the beginning. After that, in the auditorium of the Club House, all the eyes will be on who will lead the presentation. Thanks to the step structure that is able to put everyone in condition to follow without effort the contents of the speech, the orator will be like the champion of Sunday: in the middle of the attention. And supported by any technology to reach his communication goals. 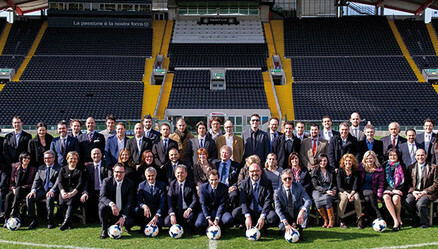 The experience and the contacts of Udinese Calcio at your service. Whatever requirement, show, surprise or special guest you may need for your mark to reach the goal, Udinese Club House is able to support you with contacts, tips and efficient and competitive services. From an illustrious testimonial to a motivational coaching support. Corporate services of Udinese Club House have alreay been chosen by many important regional, national and international realities. All of them could appreciate the versatlity of the structures, the care and professionality of the team that supports the organization that Udinese Calcio makes available for its partners. 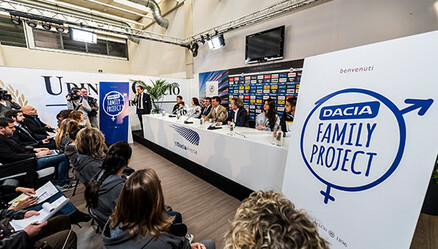 A press conference for the launch of a product or an instutional communication, a meeting reserved for the top dealers or an operative reunion of the management of a regional reality. Events like these, limited in numbers but not in importance, can find in the comfort of the spaces and of the seat of the press room- other than in the services and the restaurant of the Club House - the fittest location to get emotionality and maximum involvement. The partners of the Udinese Club House can access during the week the President restaurant, the same attended by the players and the management of the club. Have lunch there with a guest you are particularly fond of allows you to bring him in a space not accessible to most people. This way he will discover the high level of the service, the absolute quality of the ingredients and the pleasant lightness of the receipts proposed by our chefs. From the aperitive with a DJ set to the visit to the dressing rooms and to the behind the curtains of the stadium, from the award ceremony of the top sellers to the contact with the court. Every business event created in the spaces of the Udinese Club House will become an unforgettable memory for every partecipant. A moment he will remember any time he would hear the name of Udinese and of its new extraordinary stadium.